Enter the #SmileboxLoveStory Contest & you could win $500! With Valentine’s Day just around the corner, it’s the perfect time to celebrate love in all its forms. We invite you to share yours in our #SmileboxLoveStory contest, and get a chance to win a free romantic vacation for two! Not sure where to start? Take a look back at some of your old photos with the one you love. Think about how you met, how you fell for each other, and major milestones you’ve been through together. It might include that awkward first date, to an amazing trip you took, to a dramatic proposal, to becoming first-time parents together. Every love story is unique. Let’s spread the love this Valentine’s Day by sharing our stories. Visit https://plus.smilebox.com/ from your desktop computer and log in (if you don’t have an account, it’s free and fast to sign up). Choose any collage or slideshow template, and click “Personalize”. Add photos that illustrate your love story. 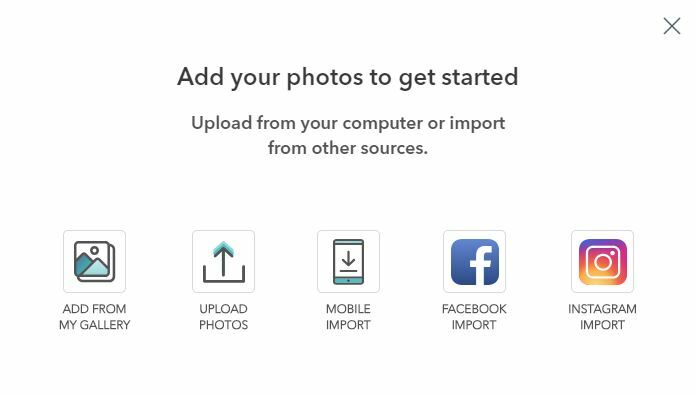 You may upload photos from Facebook, Instagram, your phone, computer, and Smilebox gallery. 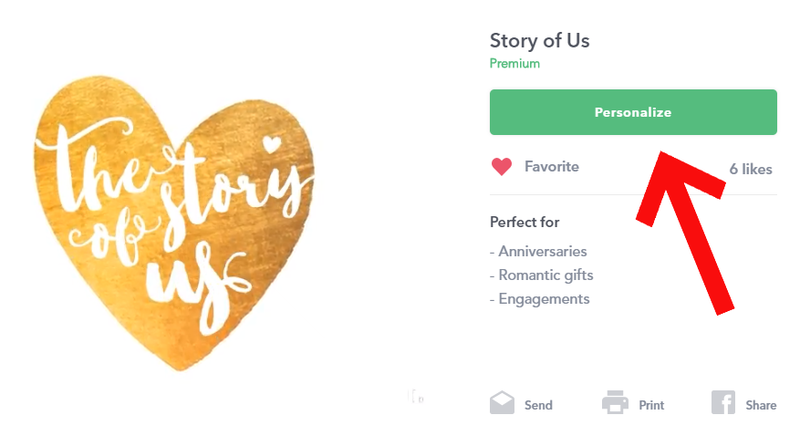 Bring your love story to life by adding text, music, colors and more. Share your finished Creation on Facebook with the hashtag #SmileboxLoveStory as a public post. A $500 gift voucher to hotelgift.com, good for thousands of hotels worldwide. The winner will be chosen by Smilebox judges based on creativity, how beautiful & moving the story is, authenticity of the images used and overall look of the creation. The winner will be announced on the Smilebox Facebook page on February 14, 2019, and the prize will be sent via email up to 5 business days thereafter. The winner will be informed of their win via their Facebook profile and/or their email address. Purchase does not enhance chance of winning. Eligible users must be 18 years of age or older. 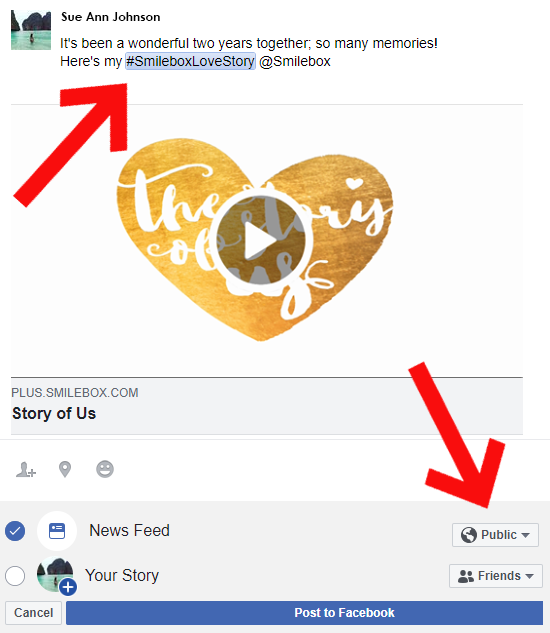 User must post a public post of Smilebox collage or slideshow to Facebook of their love story with the hashtag #SmileboxLoveStory (the “Creation“) in order to be entered into the contest. The Creation must be made by the user sharing the Creation. All Creations must be posted on Facebook from February 5, 2019 to February 12, 2019 (midnight PST). The winner will be chosen by Smilebox judges based on creativity, how beautiful & moving the story behind the Creation is, authenticity of the images used and overall look of the Creation. All decisions of Smilebox are final and binding. The winner will be announced on the Smilebox Facebook page on February 14, 2019, and the prize will be sent via email up to 5 business days thereafter. The winner will be informed of their win via their Facebook profile and/or their email address. 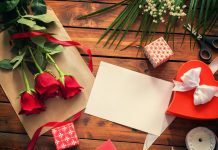 The prize is a $500 gift voucher to use in the website hotelgift.com, subject to hotelgift.com policies, which can be redeemed for a hotel booking worldwide until January 2021. Using of the voucher is subject to the applicable terms and conditions of hotelgift.com. Smilebox and its affiliates shall not liable in any case or manner for redeem voucher. The prize is not interchangeable and the winner shall not be entitled to any other prize. The winner is solely responsible to redeem voucher. The winner is solely responsible for all taxes and fees associated with prize receipt and/or use. No alternative prize, cash or other substitution, sale, auction, donation, assignment or transfer of the prize is permitted. 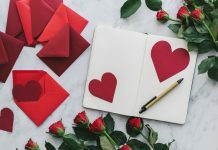 By posting a Smilebox slideshow or collage on Facebook with the hashtag #SmileboxLoveStory, the user is granting Smilebox a permission to repost their name, content and Creation on Smilebox marketing and communication channels such as social media pages, Smilebox.com, or Smilebox email campaigns. YOUR PARTICIPATION IN THE CONTEST IS AT YOUR OWN RISK. SMILEBOX HEREBY DISCLAIMS ANY AND ALL WARRANTIES, EXPRESS, IMPLIED, STATUTORY OR OTHERWISE WITH RESPECT TO THE CONTEST. SMILEBOX SHALL NOT BE LIABLE FOR ANY DIRECT OR INDIRECT DAMAGES AND/OR EXPENSES ARISING OUT OF OR RELATED TO YOUR PARTICIPATION OR INABILITY TO PARTICIPATE IN THE CONTEST AND/OR YOUR USE OF THE PRIZE, OR FROM ACTS OF MISCONDUCT OF OTHER PARTICIPANTS OR THIRD PARTIES. UNLESS PROHIBITED BY LAW, SMILEBOX LIABILITY SHALL BE LIMITED TO ONE U.S. DOLLAR (US$1.00).To the fullest extent permitted by law, in exchange for the opportunity to enter and participate in the contest and win the prize, you waive, release and hold harmless (“Release“) any and all rights, claims, damages, liabilities, costs, attorneys’ fees, expenses, and causes of action whatsoever (“Claims“) that you may have against the Smilebox and its officers, directors, employees and agents (the “Released Parties”). This Release covers, without limitation, any claims arising directly or indirectly out of your entry into and participation in the contest, your status as an entrant, finalist and/or a potential and/or actual winner, including, without limitation, claims based on personal injury, death, property damage, libel, slander, defamation, invasion of privacy/publicity, portrayal in a false light and any claim relating to Smilebox’s exercise of the publicity rights you have granted to Smilebox hereunder. Further, you hereby release the Released Parties from any third-party intellectual property claims arising from or in connection with your entry. This Release survives the expiration of the contest. Now go and spread the love with #SmileboxLoveStory!